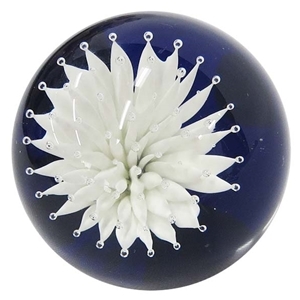 MoonMarble.com - Ernie Kober - "White Flower Airtrap Marble"
Art Glass → Contemporary Handmade Marbles → Ernie Kober - "White Flower Airtrap Marble"
Handmade contemporary marble by Ernie Kober. This marble is a compression style marble featuring a many white petaled flower with air bubbles at the tip of each petal. It has a deep blue transparent background. Approximately 1 1/2" in diameter.